It was back to Summerhayes this week but the day didn’t get off to the best of starts when I received a text from the Torquay Tart saying ‘It’s whooping time!’ which put me on a downer as I thought he’d taken up golf or left the country or something! He went on the say that he’s on fire now, a big gun on the open circuit and taking scalps wherever he goes and is just missing mine from his trophy room! He’s obviously delusional and I’ve gone from feeling sorry for him to actually thinking he needs professional help, if you’re reading this Tart, please seek help now! I picked Janders up on my way and we were soon pulling into the car park, I said hello to all the usual faces and it wasn’t long before the Tart stopped lurking in the shadows and made his presence known, he was all togged out in a new set of black and orange clothing with Bait-Tech and Guru logos plastered all over it so he certainly looked the part, ask him how much they cost the next time you see him! After a quick coffee it was time for the draw and by the time I got to the bucket, there were only a few balls left, Janders stuck his hand in and pulled out peg 11 which is a nice silvers peg and one I would have liked. I went in and pulled out peg 7 which is on the end of cyanide straight, a corner peg with reeds and lilies, so basically a carp peg which wasn’t great as I like to target the silvers and I really can’t draw for toffee at the moment! 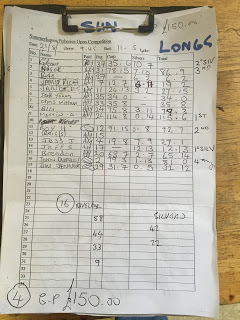 Elsewhere on the side bet front, Glynn had drawn peg 37 which can be a bit hit or miss for silvers and the Tart had drawn peg 20 and agreed to having the pound on silvers even though he was intending to fish for carp, I told you he was a strange boy! I got to my peg and it was already quite windy with the forecast for more of the same later, my neighbours for the day were in-form Martin Addicott on peg 9 and after a few weeks off, normal service was resumed with Jess Jordan on my right in peg 4 which was also the golden peg. I set up a 10 x 11 MW F1 Slim for two lines at 10 metres and a 0.3 gram Nick Gilbert Mini Gimp for the 5 metre line. The side tray was nice and simple with just some micros I’d soaked the night before, Bait-Tech 4mm Xpands and some 6mm hard pellets if small fish became a problem. On the whistle I fed all three lines with half a pot of micros before starting straight out in front at 10 metres, I missed a couple of bites before catching a 2oz skimbob and a few more followed before I bumped what felt like a better skimmer, I then had a small carp which prompted me to switch to the other line where I had a couple more skimbobs before another carp muscled in on the action. After an hour I had around a pound of silvers plus the two carp and was doing okay but then Jess hooked a good skimmer that leapt out of the water and wiped out my early lead and then some in one fell swoop. I carried on catching small skimmers between 2-4oz from the two longer lines and was dripping in a few micros on the shorter line every time I shipped out but wanted to leave it as long as possible before trying it. Martin was getting the odd carp but not really bagging and from what I could see Janders was struggling on peg 11. After two and a half hours my bites were starting to slow up and I probably only had a couple of pounds of silvers in the net and was going nowhere fast, Jess had added another decent skimmer but unless things improved drastically neither of us would be challenging for an envelope today. I decided to come in on the shorter line and my first proper bite saw me strike into a carp that tore off towards Jess’s swim and snapped me – great! After tying on another hooklength I was back in action (I use the term very loosely!) and getting the odd blade but the soft pellet was getting battered by small roach so I tried a Marukyu red 6mm Jpz pellet but that didn’t improve things so it was onto a banded 6mm hard pellet. This helped a bit and I had a couple more small skimbobs before hooking a big skimmer that flew out the water and straight off the hook which about summed the day up. Martin was now catching really well on paste and even had a couple of decent skimmers on it, which he took great delight in showing me! Jess had sneaked in a couple more decent skimmers and when Adie walked round and said Glynn and Ray were both catching silvers I knew my bad run wouldn’t be ending today. I was still getting small skimmers, roach and of course the odd inevitable carp which are just a pain in the arse when the float sailed away and I hooked a better fish which didn’t feel like a carp and I was right when a nice 12oz tench popped up. With about an hour to go I started to catch small skimmers quite well and even had a nice little crucian carp and was quite enjoying myself. Martin was now motoring and had put his third keepnet in and was even playing one when the whistle went. My final tally was 36 skimmers and roach plus the tench and crucian and I thought I had between 4-5lb. As I packed up Jess said he had five decent skimmers plus some bits so I knew he’d beaten me. I packed up and was loading the car when Janders arrived and he said he’d had four skimmers plus several carp. We caught up with the scales after they weighed the first couple of pegs who weighed 34lb and 35lb 8oz before Nigel Wickham took the lead from peg 31 with 86lb 9oz which also included 7lb 10oz of silvers. Ray had 6lb 2oz of silvers from peg 27 and then Bill ‘The Paste King’ Hopping had 79lb 3oz from peg 24. Next was the Tart who weighed 65lb 14oz but crucially only had 2lb 7oz of silvers and I reckon instead of having Guru and Bait-Tech plastered all over his waterproofs, he ought to have Savlon instead! 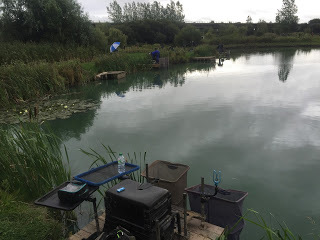 Jeff Sparkes on peg 17 then went into the silvers lead with 12lb 13oz, Roy Hughes had 92lb 7oz on peg 12 to go into second place and then Janders had 3lb 2oz of silvers and 24lb 13oz of carp. Next up was Martin and after several weighs his total was read out at 115lb 6oz, well done mate. My silvers went 6lb 11oz and six nuisance carp took my total to 19lb 2oz. Jess had 7lb 9oz of silvers and then John Dursley weighed 81lb which put him in fourth place. Last to weigh was Glynn and he went into second in the silvers with 10lb 7oz and took a nugget off me but pounds off Janders and the Tart made up for it. So my bad run continues and next stop is Dillington on Sunday and to be honest I’m not confident of it ending then! I can’t go without saying a massive congratulations to Tackleuk’s Scott Russell for winning the Feeder Masters qualifier on the Bristol Avon at the weekend with just over 14lb, good luck for the final mate.